Be the first to share your favorite memory, photo or story of Aldean. This memorial page is dedicated for family, friends and future generations to celebrate the life of their loved one. Aldean Cauley Holifield, 77, of the Salem Community passed away on Friday, March 15, 2019. She was born June 18, 1941 in Pascagoula, MS to the late Billy and Margie Cauley. Along with her parents, Aldean was preceded in death by her loving husband of 60 years, Meredith “Buck” Holifield. She is survived by her daughters, Brenda (Criss) Tanner and Velinda “Linnie” (Robert) Tanner; grandchildren, Christy (Brian) Miller, Cathryn (Allen) Von Kanel, Carla (Quintin) Smith, Mandy (Charlie) Faggard, Chuck (Meghan) Tanner, and Tiffany (Joshua) Cole; great-grandchildren, Macy, Noah, & Isabella Miller, Kaylie, Blake, Keira, & Bryce Von Kanel, Megan & Briana Smith, Kerrigan & Tolly Faggard, Tori & Cody Tanner, and Londyn Cole; along with numerous other relatives and friends. 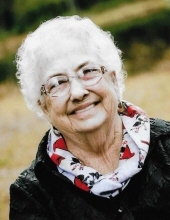 Visitation will be held on Tuesday, March 19, 2019 from 10:00 a.m. until 12:00 p.m. at Wade Baptist Church. Funeral service will begin at 12 noon with Rev. Brian Miller officiating. Interment will immediately follow at Carter Cemetery, Section Line Rd. in the Salem Community, MS. Pallbearers will be Rev. Brian Miller, Chuck Tanner, Allen Von Kanel, Quintin Smith, Charlie Faggard, and Joshua Cole. To send flowers or a remembrance gift to the family of Aldean Cauley Holifield, please visit our Tribute Store. "Email Address" would like to share the life celebration of Aldean Cauley Holifield. Click on the "link" to go to share a favorite memory or leave a condolence message for the family.